Freedom Reins by RWC sire Sultan's Starmaker- 1997 All American Horse Classic 2 Year Old Fine Harness Reserve Champion. 1998 All American Horse Classic 3 Year Old 3 Gaited Sweepstakes Grand Champion. 1999 Bonnie Blue Junior 3 Gaited Reserve Champion. Ribbons And Reins- 2006 Lexington 2 Year Old Fine Harness Champion. 2006 All American Classic 2 Year Old Sweepstakes Reserve Grand Champion. 2007 Lexington 3 Year Old Fine Harness Champion. 2007 National 3 Year Old Futurity Reserve Grand Champion Fine Harness Division. 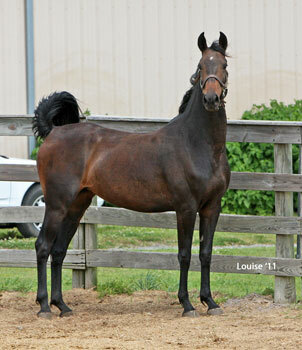 2007 All American Classic 3 Year Old Sweepstakes Fine Harness Reserve Grand Champion. 2008 Indy Charity 3 Gaited Junior Champion. 2009 All American Horse Classic 3 Gaited Grand Champion. 2011 Bonnie Blue 3 Gaited Amateur Reserve Grand Champion. 2011 Shelbyville 3 Gaited Amateur Reserve Champion. 2012 All American Horse Classic 3 Gaited Amateur Reserve Grand Champion. 2012 UPHA/American Royal 3 Gaited Amateur Reserve Grand Champion. Royal Reins- 2009 Old Dominion Futurity Benefit 5 Gaited Junior/Novice Champion. 2009 Old Dominion Futurity Horse Show 5 Gaited Junior/Novice Champion. 2010 Raleigh Invitational 5 Gaited Show Pleasure Reserve Grand Champion. 2010 Rockbridge 5 Gaited Show Pleasure Champion. It's Only Money Honey (AKA Olivia Reins)- 2010 All American Classic 2 Year Old Sweepstakes Fine Harness Reserve Grand Champion. 2011 Big D UPHA 3 Gaited Champion. 2011 Big D UPHA Park Pleasure Champion. 2011 NTASHA Fall Park UPHA Park Pleasure Reserve Champion. 2012 All American Horse Classic Park Pleasure Junior Champion. 2012 Mid-America Mane Event Park Pleasure Junior Champion. WC Closing Argument (14 SBR Points)- 1993 Asheville Lions 3 Gaited Show Pleasure Grand Champion. 1993 Rock creek 3 Gaited Show Pleasure Jr. Ex. Champion. 1993 Lexington 3 Gaited Show Pleasure Jr. Ex. Reserve Grand Champion and 3 Gaited Show Pleasure Jr. Ex. Champion. 1993 ASHAV 3 Gaited Show Pleasure Jr. Ex. Grand Champion. 1993 Kentucky Fall Classic 3 Gaited Jr. Ex. Champion. 1998 Milwaukee Sprinng 3 Gaited Country Pleasure Jr. Ex. Reserve Grand Champion. 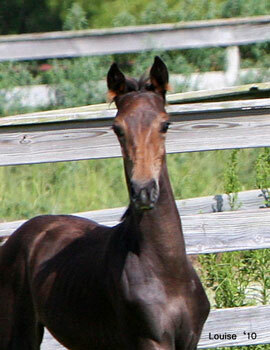 1998 Tambark 3 Gaited Jr. Ex. Champion. 1998 Kentucky State Fair 3 Gaited Country Pleasure Jr. Ex. Grand Champion. 1998 Wisconsin Futurity 2 Gaited Country Jr. Ex. Grand Champion. 1998 American Royal 3 Gaited Country Grand Champion. RWC New Trial- 1994 UPHA Spring Premiere 3 Gaited Junior Champion. 1994 Bonnie Blue 3 Gaited Junior Champion. 1994 Kentucky State Fair 3 Gaited Junior Reserve Grand Champion. 1994 Eastern States 3 Gaited Junior Champion. 1995 Bonnie Blue 3 Gaited Reserve Grand Champion. 1995 Children's Benefit 3 Gaited Amateur Reserve Grand Champion. 1996 UPHA Spring Premiere 3 Gaited Amateur Reserve Grand Champion. 1996 Roanoke 3 Gaited Ladies Champion. 1996 Children's Benefit 3 Gaited Ladies Champion. Starmaker's Delight- 1994 Rock Creek 3 Year Old 3 Gaited Reserve Champion. 1994 All American Classic UPHA 3 Gaited Reserve Champion. 1995 All American Classic 4 Year Old Sweepstakes Grand Champion. 1996 DesMoines Spring 3 Gaited Champion and 3 Gaited Novice Champion. 1996 Tanbark 3 GAited Grand Champion. 1996 Wisconsin Futurity 3 Gaited Reserve Grand Champion. 1997 Tanbark 3 Gaited Ladies Grand Champion. 1997 Minnesota Futurity 3 GAited Grand Champion. WC Timely Affair- 1995 Kentucky State Fair National 3 Year Old Futurity 3 Gaited Division Reserve Grand Champion. 1996 Lexington 3 Gaited Junior 15.2 & Under Champion. 1996 Kentucky State Fair 3 Gaited Junior 15.2 & Under Grand Champion. Tandy Carol- 1996 All American Horse Classic UPHA 3 Gaited Reserve Champion. 1997 Pro-Am 3 Gaited Junior Reserve Champion. 2000 Pro-Am 3 Gaited Park Reserve Grand Champion. Breathless Affair- 2000 Bonnie Blue Junior Fine Harness Reserve Champion. Brookhill's Tom Tom- 2006 River Ridge UPHA 3 Gaited Park Pleasure Reserve Champion. 2007 All American Horse Classic Park Pleasure Junior Champion. 2008 Roanoke Park Reserve Grand Champion. 2009 Roanoke Park Amateur Reserve Grand Champion. 2010 Summer Fun 3 Gaited Country Grand Champion. 2010 Summer's End 3 Gaited Show Pleasure Grand Champion. 2011 The Dixie Cup Open English Reserve Grand Champion. 2011 Gasparilla 3 Gaited Country Local FL Owned Reserve Champion. 2011 Harvest Days Park Reserve Grand Champion. Peri Affair- 2005 Ohio State Fair Fine Harness 3 Year Old Reserve Champion. 2007 Dallas Summer Classic 3 Gaited Pony Grand Champion. 2010 KVHA Point Show 3 Gaited Reserve Champion. 2010 Blue Ribbon Fall Classic 3 Gaited Junior/Limit Champion. 2011 KVHA 3 Gaited Reserve Champion. Longvue's For Love And Profit- 2009 UPHA Almost Summer UPHA Park Pleasure Champion. 2011 Continemtial Divide Country Western Novice Champion. 2011 Denver Queen Country Western Novice Champion. End Of Affair- 2004 Oshkoch Charity- Show Pleasure Driving Champion. Joyful Affair- 2003 Tampa Charity Junior/Novice Reserve Champion. 2004 Gasparilla Fine Harness Junior Champion. 2004 Children's Benefit UPHA Fine Harness Reserve Champion. 2005 N C State Fair Fine Harness Reserve Grand Champion. ASHAM 3 Gaited Show Pleasure Limit Champion. Pleasant Reward (9 SBR Points)- 1990 Milwaukee Spring 5 Gaited Ladies Champion. 1990 Madison Classic 5 Gaited Amateur Grand Champion. 1991 UPHA Chapter V 5 Gaited Ladies Champion. 1992 Nebraska Charity 5 Gaited Grand Champion. 1992 Missouri State Fair 5 Gaited Reserve Grand Champion. Northern Empress (BHF)- 1986 Rock Creek 3 Gaited Novice Champion. 1986 Lexington 3 Gaited Over 15.2 Top Three. 1986 Kentucky State Fair 3 Gaited Over 15.2 Top Three. RWC CH Empress In Black- 1991 Kentucky State Fair RWC 3 Year Old National Futurity Fine Harness Division. 1991 All American Horse Classic 3 Year Old Sweepstakes Fine Harness Reserve Grand Champion. 1994 All American Horse Classic 3 Gaited Grand Champion. 1995 Mercer County Fair 3 Gaited Grand Champion. Harlem's Abba Labba- 1987 Rock Creek Fine Harness 2 Year Old Reserve Champion. WC I've A Jewel- 1988 Kentucky State Fair WC 2 Year Old Fine Harness Horse. 1989 Santa Barbara UPHA 3 Gaited Champion. 1989 Kentucky State Fair RWC National 3 Year Old Futurity 3 Gaited Division. WC Harlem's Yankee Queen- 1995 Lexington Junior 3 Gaited Grand Champion. 1995 Kentucky State Fair WC 3 Gaited Junior Over 15.2 and RWC Junior 3 Gaited Championship. Mambo Queen- 2009 Colorado Classic 5 Gaited Reserve Grand Champion. 2009 Nebraska Charity 5 Gaited Show Pleasure Grand Champion. Fastback- 1987 Scottsdale Charity Fine Harness Reserve Grand Champion. 1988 Utah Charity 5 Gaited Grand Champion. Singletree's Ballerina- UPHA Spring Premiere 5 Gaited Junior champion. 1987 Children's Services 5 Gaited Junior Reserve Champion. Soft Serenade- 1990 River Ridge 3 Gaited Limit Champion. 1994 Twin States 3 Gaited Grand Champion. WC CH Super Serenade- 1989 Kentucky State Fair WC Kentucky County Fair 3 Gaited. 1991 Kentucky State Fair RWC 3 Gaited Over 15.2. 1993 Kentucky State Fair WC 3 Gaited Ladies Over 15.2. 1990 Lexington 3 Gaited Grand Champion. 1991 American Royal 3 Gaited Ladies Grand Champion. RWC Last Serenade- 2008 Kentucky State Fair RWC Kentucky County Fair 5 Gaited. 2007 Rock Creek 5 Gaited Junior Stallion & Gelding Champion. 2010 Shelby County 5 Gaited Amateur Grand Champion.